As part of my dissertation research on early Mormon history, I spent 2012 in search of long-dead Mormon pioneers whose lives rarely make it into American history books. But last year, Mormons, at least living ones, were not hard to find in America. Mormons were running for president. 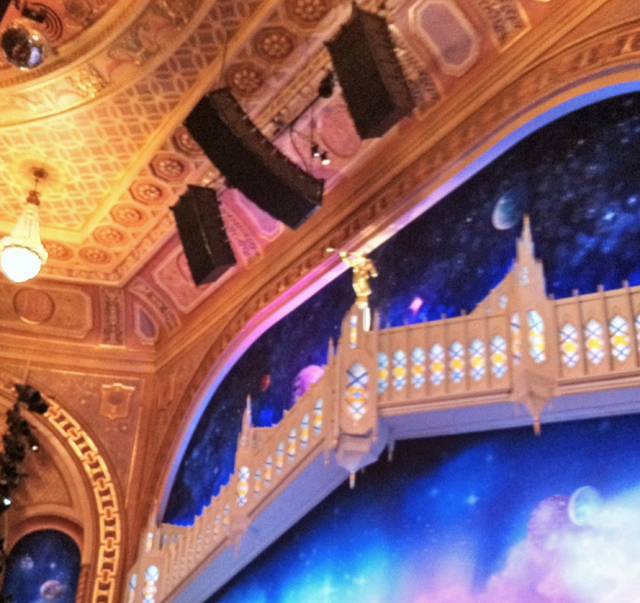 Mormons were on Broadway. 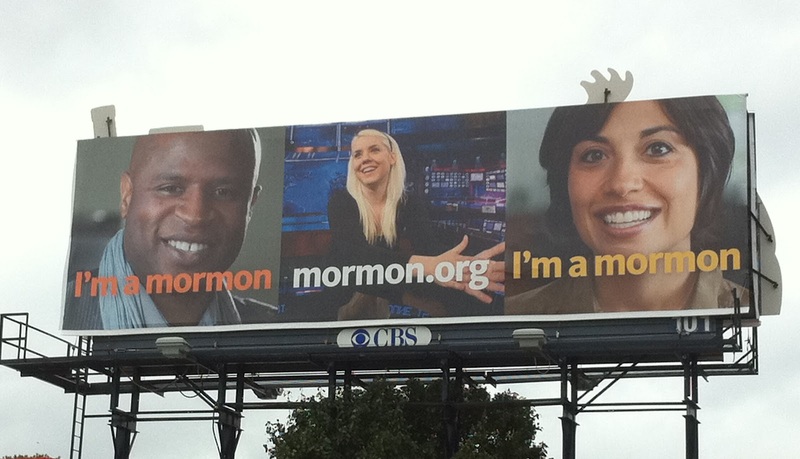 Mormons were on billboards, proclaiming that they are not all like Mitt Romney or Elder Price. Mythical (or mystical) Mormons were everywhere too. This first picture was taken (surreptitiously, hence the poor quality) in the Eugene O’Neil Theater in New York before my wife and I sat down to watch the musical, The Book of Mormon. The golden statue you can hardly make out is the last Book of Mormon prophet and historian, named Moroni. According to the Church of Jesus Christ of Latter-day Saints, he completed the last chapter of the Pre-Columbian Christian history, then buried the golden plates on which this history was recorded, before he was killed by his more savage kin. Some 1,700 years later, he came back as an angel, and helped Joseph Smith unearth the plates, which Smith translated into what would become the Book of Mormon. Trey Parker, Matt Stone, the creators of “South Park,” and Robert Lopez, of “Avenue Q”, use the Angel Moroni to adorn the top of the stage where below their satirical romp through Mormon missiology unfolds to laughter and gasps. The musical opens with the angel spinning around like a top, to signify the show’s irreverence. The show is on tour through American cities. And thus so is the Angel Moroni. Most of the time, the Angel Moroni is treated with more deference, at least by Latter-day Saints. He normally can be found sitting atop Mormon temples. Here he is—the tiny golden dot on top of the Jordan River temple, south of Salt Lake. 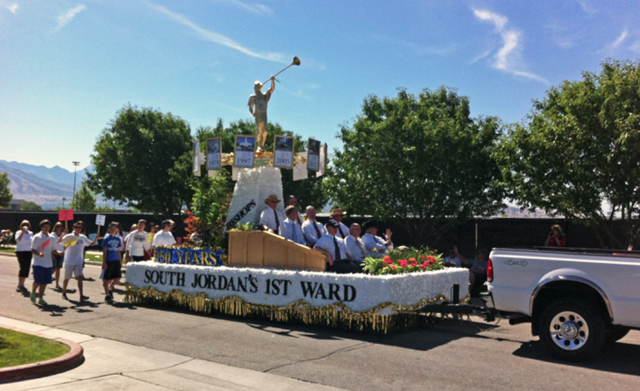 But sometimes, even the Mormons bring the Angel Moroni down to earth—not quite for Broadway—but instead, for a midsummer parade float I witnessed in South Jordan, Utah. The proliferation of Mormons in 2012—both political and satirical—meant that everyday Latter-day Saints felt a need to reclaim their sacred symbols. Even to parade them down a suburban Utah street. Contributors Anna and Max live in Boston.